They Still Wear White Dresses, Don't They? High school graduations are tradition-laden events, and no tradition is more long-standing than the attire worn by graduates of Oak Park and River Forest High School. 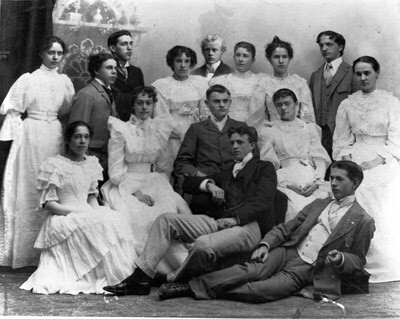 Since the first class of three graduates in 1877, tens of thousands of students have received their diplomas, dressed not in caps and gowns, but in dark suits for boys, and white dresses with a bouquet of roses for girls. Only a handful of public and private high schools across the country retain this practice, which dates from the nineteenth century. While still white, the simple dresses were tailored in sailor style and had no decoration or adornment except a black tie. In addition, no flowers were carried that year. It was reported that this change would save each girl about $30 on her graduation dress. Thirteen boys from the class of 1918 missed the graduation ceremony because they were already in military service. In addition to the alteration of dress code in 2000, when girls were given the option to wear white pantsuits, another notable change came in 2016. In an effort to become more inclusive, OPRF graduates were given the option to wear either white or dark clothes that follow the traditional dress codes regardless of gender. Seniors at OPRF have voted in the past to decide if they want to retain the formal attire over the option of caps and gowns. Each time they decided to continue the tradition. At this year's graduation ceremony, they again wore formal dress, thus continuing a tradition of more than 140 years.